For more than a decade, Bob Worrall of Burlington, Ontario has exerted a positive influence on the development of pipers and pipe bands throughout the Maritimes. 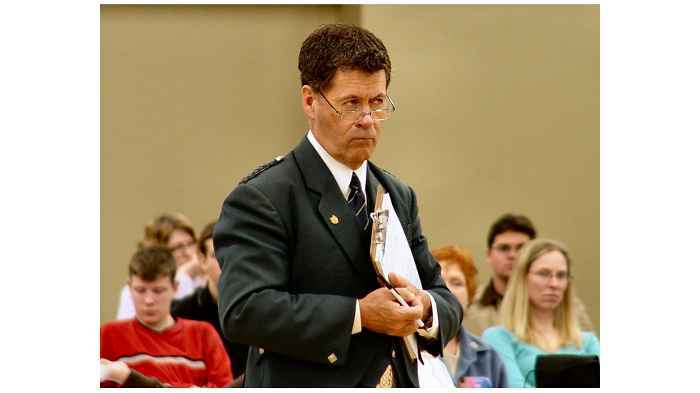 He has served annually as principal piping instructor at March Break Weekends and Summer Schools at St. Ann's Gaelic College since 1986, and conducts numerous workshops for players of all ages, bands, teachers and judges. He has performed in piping recitals and has judged competitions across the region. With his help, pipers and bands from the Maritimes have been able to take their place among the country's top performers, and some have achieved international recognition. Born in the hospital lobby during a raging snowstorm on March 1st, 1951 in Wingham, Ontario, Bob grew up in nearby Teeswater with his parents, Albert and Alice (Hughes) and an older sister, Elaine. A brother, David, died in 1949. He attended local schools before entering Waterloo Lutheran University where he received his Bachelor's degree with the gold medal in Geography, and later a Master's degree. He studied at the University ofWestern Ontario before teaching a one-year sabbatical replacement at the University of Toronto. He returned to Teacher's College at Western and in 1979 was hired to teach Geography in Burlington. Since 1985 he has served as Head of the Social Sciences Department at Queen Elizabeth Park High School in Oakville, Ontario. Becoming a piper was the result of living in Teeswater. 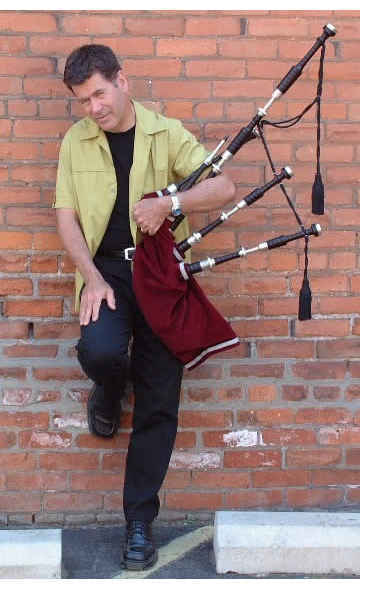 "The village was very supportive of Scottish music," Bob remembers, "and especially piping, much like the town of Antigonish here in Nova Scotia." Bill Millar, originally from Omagh, in Northern Ireland, was hired in 1963 to get a band going and village officials realized that he should teach youngsters as well. Bob's parents were cautious in their encouragement when he came home and announced that he wanted to learn to play the pipes. His older cousin, whom he called Aunt Jean, also showed enthusiasm for his piping efforts. "You just didn't go out to her house at all without bringing the pipes and playing for her out under the trees in the summer or in the living room in the winter," Bob remembers. Chanter lessons began in the fall of 1963. Bob had his pipes in May, and played his first competition in June. "In retrospect," he says, "It was probably horrendous. John Wilson was the judge and he gave me a mark of 64. I was delighted because I thought that, after only one month on the pipes, I had passed!" Millar was a phenomenal teacher, very patient, instinctively musical, and always positive. His students enjoyed a great deal of competitive success. Under his guidance, Bob continued to grow in his piping and, when the graded system was introduced in 1968, he was placed in Grade 2. He won the first two contests of the season and was up-graded to Grade 1. That year, and again in 1969, Bob was named Amateur Piper of the Day in Maxville. He was promoted to Open for the 1970 season. Piobaireachd was not an amateur competitive event so, to this point, Bob had little or no instruction in it. It was considered critical for an open player, however, so Millar sent him to study with John Wilson. "I was hungry for it," says Bob. He worked diligently, and at the first contest of the next season, he was named Open Piper of the Day. In 1971, he won the first of his seven North American Championships and over a span of thirteen years was named Ontario's Champion Supreme twelve times. Bob went overseas to compete in 1975 and again the following two years. He won a number of awards, including two first prizes in light music events at the Northern Meeting held in Inverness. It was assumed that once you entered competition at this level, you would continue to go back year after year. In Bob's case, this was not possible. Once he entered Teacher's College in 1978, and later when he began to teach high school, he was unable to attend the Northern Meeting which was held in September at that time. Bob continued to compete in Ontario and on the US circuit, but, though he loved to perform, the competitive side of piping no longer fulfilled him. His mother's battle with cancer helped him make a conscious decision to drop out of competition. To dispel a rumour that his fingers were failing him, he entered at Ligonier where he again won Piper of the Day. Later, his students at the Gaelic College expressed an interest in hearing him play competitively and he entered a few events, but essentially his days on the boards were behind him after 1983. Throughout these years, Bob was also involved in bands. He played in the local Grade 4 band before going to play with Bill Millar's band in Goderich. It had just been promoted to Grade I which meant quite a jump for the young piper. Though the band won a number of prizes, its drum corps departed, andMillar thought it would be best if Bob went to play with Davie Adamson'sCity Of Toronto Pipe Band. Bob thoroughly enjoyed a year with Adamson but, when Millar was offered the London Service Battalion Pipe Band the next fall, a sense of loyalty to his teacher dictated that he would follow. In its first season, the London band became the Grade II Champions Supreme for Ontario, but at the end of the season its military funding was cancelled and Bob returned to the City of Toronto under PM Chris Anderson who had come out of retirement in 1970 following the tragic death of Davie Adamson. "Chris was a phenomenal player," Bob remembers, "and while he didn't teach me directly, he greatly influenced me in terms of tone, technique, and musicality. When he would come to band practice, he would strike up his pipe and it was always going beautifully. His playing was immaculate. It was something to model you own playing after. He was always as good or better than the best piper in his band." In 1972, Bob joined the General Motors Pipe Band under PM George Campbell. The band dominated Grade II and was put up to Grade I , taking its share of prizes there for a couple of years. The stress of playing at this level took its toll, however, and, perhaps because of piping burnout, the band decided to take a year off. For Bob, the time generated by not having to attend two band practices a week soon became filled up with teaching private students. When the band reassembled, he extended his leave, making it permanent in 1975. That year Bob moved to London, Ontario to do post graduate work and found himself a near neighbour of Willie Connell. Willie had recently come from Glasgow and agreed to take Bob as a pupil. While Bill Millar's teaching style was perfect in his youth, and John Wilson's playing, even in his 70's, was as near to perfection as you could get in terms of execution, here was Willie Connell with his wealth of knowledge about piobaireachd! Bob studied with him from 1975 to 1983. "Willie really made me think about the tunes (piobaireachds) I was playing," Bob remembers. "Prior to that, my teachers demonstrated, and I duplicated, but Willie explained the phrasing of the tune, how the tune worked. As a result I became a more musical player. He taught me how to think through a tune, and I try to teach that to my own students." Bob came to Nova Scotia for the first time in 1979 to judge at the Antigonish Highland Games. 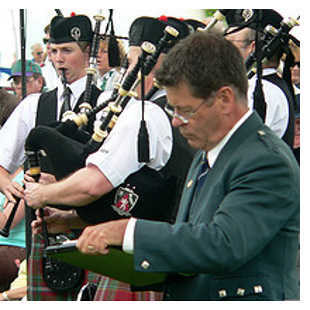 It was the International Gathering of the Clans, and a number of top Grade I bands were brought in to compete with PM Barry Ewen's Scotia Legion Pipe Band. Bob was impressed by the Nova Scotians. "You don't get much better than that," he says. He placed them first in both M/S/R and Medley events. Bob feels that the overall quality in the Maritimes has been steadily improving. "The best bands here are as good in their grades as the best bands in any other jurisdiction on the continent, and better than many," he says. "This is true in the solos as well. Look at Grade I amateur. In a contest in Nova Scotia, you might have six or seven competitors. In Ontario you would have a lot more. But the reality is, the average players here are better than the average players there, and your top players, Ryan MacDonald and Matt MacIsaac for example, were major winners in Maxville this year (1996)! The Ontario players worry about Maxville because the Maritime players come and they always place." Bob taught summer school at St. Ann's for the first time in 1986. He has returned every year since and the College's reputation has soared. The progress achieved by every student is important, but the accomplishment of one elderly lady stands out vividly in his mind. In her 70's, she attended the adult session for one week and was determined that she would learn to play a bagpipe tune. Together, teacher and student worked through the scales and early gracenotes and then plunged right into the first tune, a slow air. She practiced for hours between classes. On the Friday, all the pupils demonstrated the new skills learned during the week. As each student performed, this woman had her book open in front of her and was studying the page. When it came to be her turn, she snapped the book closed, pushed her chair back, stood up, and played by memory without any errors the entire slow air. "You could see the determination in her face," says Bob, "And I knew the fulfillment it brought her to be able to do this. I had tears coming down my face. It was her achievement, but I had experienced it with her. It was great!" Bob enjoys playing in recitals like those he has done in March for the Antigonish Highland Society School of Piping and Drumming. "Unlike competitions, where the piper plays a few minutes before a judge, in recitals you have the whole evening. I find that a lot easier, and I really enjoy building up a rapport with the audience." He certainly succeeds in entertaining his audience and in educating them as well, giving the histories of the various tunes he plays. He often uses his set of John Walsh's shuttle pipes and Hamish Moore's bellows small pipes in addition to his Highland pipes and they are always a great hit. For much of the year, Bob travels the continent. In fact, it is no exaggeration to say that he is away from home forty weekends each year, teaching, performing or judging. When the competition season is ending in Canada, it is still going strong in the States. You can still have events in Florida and Texas as late as January. Then the new seasons begin again as you move back up north. "It never stops," he says. "I work very hard at trying to be the best adjudicator I can be. It's an art form. You have to be able to listen well and hear different things happening. You have to evaluate those things in an absolute way, but also in a relative way vis-�-vis the other performances in the event. It's that relative evaluation that is the hardest." Bob remembers the disappointment of receiving sheets from judges which had very little on them that helped him improve. In his own judging, he tries to give as much back to the players as possible. "Its important to show where the piper or band went wrong, but it's also important to give positive reinforcement, to show them what they are doing right, especially for lower grade bands and amateur players who are trying their best to improve. I always try to write as much as I possibly can." Bob often fills both sides of the judge's sheets, and has even written along the margins. His reputation for thoroughness has resulted in invitations to judge at the World Pipe Band Championships on three different occasions. Not all of the honours he has acquired over the years were medals or trophies. One came after he won the Amateur Piper of the Day at Maxville for the first time. Arriving home, he found in his front door a large hand-made card of congratulations signed by eight hundred residents of his village. Another was a certificate he received at the first Middleton Games in Nova Scotia where he was inducted into the historic Order Of Good Cheer. A third was a mounted print given to him by the Antigonish Highland Society School of Piping and Drumming following one of his many recitals in Antigonish. "These things mean a great deal to me," says Bob, "Because they were given to me by friends who appreciate what I am trying to do." Bob takes his commitment to teaching very seriously. He has private students who come to his home Mondays through Thursdays during the regular school year. "It's important to pass on what you've been given," he says. "All of my teachers gave so freely of their time, they gave up a lot of their lives for me. I believe I'm obligated to try to do that for others as well." When Ryan MacDonald, a young Cape Breton pupil, won Amateur Piper of the Day at Maxville in 1996, he was as proud as when he achieved that honour for himself in 1968. Bob gradually evolved into a composer of bagpipe music. Returning one night from band practice with General Motors, his hands just started playing musical phrases which he wrote down as soon as he got home. He could tell that they would make very good third and fourth parts of a jig, but couldn't make first and second parts to lead them off. Years later he was in Antigonish for the games and went along to hear the Barra MacNeils perform at the annual Scottish Pub. Their musical style impressed him and it was there that the first two parts of his jig came to him in a flash. He scribbled them down on the back of an envelope. He called it "St. Ninian's Parish Centre Ceilidh", the first of many of his tunes which can be found published in "The International Collection, Highland Bagpipe Music", Books I and II. Advice to young players? Bob is concerned that in many areas across North America there is a tendency for few if any of the amateur players to come along to listen to the open pipers. On occasion, he has judged pipers of the calibre of Bill Livingstone and wondered where all the Grade 1 and 2 players were. "If their events are finished," he suggests, "they should be on the sidelines listening. In Nova Scotia, when the big guns come up to play, the kids are there to hear them. This is great. It's the best lesson young players can get." And what about learning to play piobaireachd? "It's absolutely essential that kids are exposed to it," says Bob, warming to the subject. "Teachers need to try to see that their pupils get as much of it as they can. If they are not proficient in piobaireachd playing themselves, that shouldn't stop them. There are workshops and tapes available which they can make use of to help their students along. I am concerned that open players are not taking part in every piobaireachd contest that is available to them on the circuit. They are the role models for the up-and-coming players and it is critical that they show that piobaireachd is important. Players with piobaireachd backgrounds are almost always better at the light music. They are certainly better march players. The subtleties of phrasing and the dynamics within a phrase in a piobaireachd are also the essence of 2/4 marches. Kids don't necessarily have to compete in piobaireachd, but every kid should have the opportunity to study it. The Atlantic Canada Pipe Band Association might consider adding a Novice Piobaireachd event to their list of approved competitions. The entrants could be asked to play a ground only, and in this way more young players could be nurtured in their piobiareachd playing before the heavier demands of the Junior, Senior and Open events." You never stop learning, Bob says. "As long as you are competing, you should be getting tuition. It doesn't have to be on a super formal basis, but you need a guide. Everyone needs a guide, someone to listen. At my last competition at the Fergus Games in 1983, I had a lesson that week. If this is not happening, even the top players start stagnating. This is true of pipe majors and judges as well who should be attending workshops and seminars to hone their skills. We can all learn from each other." Plans for the future? Well, a third volume of pipe music is just about ready to go to the printers, and, with two recordings behind him already - his first solo recording in 1983 and later "An Evening of Champions" which was recorded as a benefit for the Canadian Cancer Society - he hopes to play his Highland, shuttle and small pipes on another solo CD in the not too distant future, "Before my fingers give out," he jokes. That's not likely to happen for many, many years!